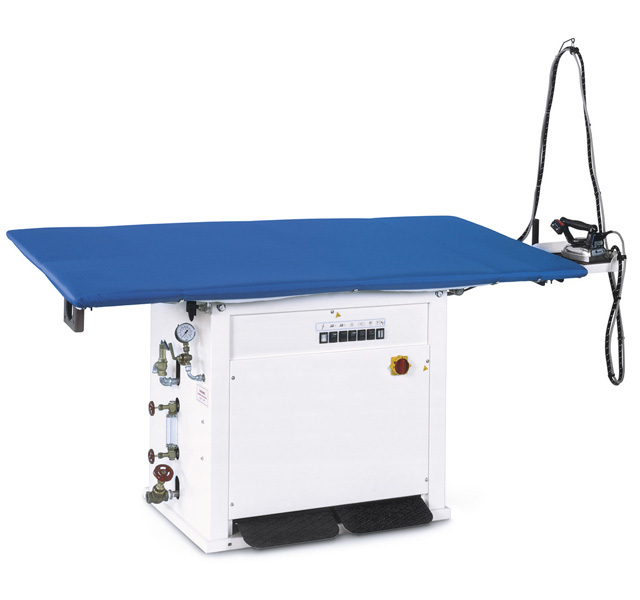 Model GB-MV: Rectangular shaped, up-steaming and vacuum ironing table with steam iron. Available with built-in electric boiler and vacuum unit (GB-MV/A) or to connect to central steam with built-in vacuum unit (GB-MV/V). Vacuum outlet Ø 120 mm. Gross weight (crate) 318 Kg. Gross weight (box) 368 Kg. Gross weight (crate) 366 Kg. Gross weight (box) 406 Kg. Gross weight (crate) 410 Kg. Gross weight (box) 474 Kg. Gross weight (crate) 485 Kg. Gross weight (box) 555 Kg.